Rough-terrain equipment continues to play an important role in materials handling and Melissa Barnett looks at some of the issues surrounding the rough and ready vehicles. One of the biggest issues facing all manufacturers is tightening environmental regulations, with US authorities this year rolling out the final phase of Tier 4 regulations for engines between 75 and 175 HP. According to the United States Environmental Protection Agency (EPA), off-road engines are responsible for the emission of 47% of particulate matter (PM) and 25% of Nitrogen oxides (NOx) from all mobile sources. Particulate matter is minute particles of carbon and other poisonous substances created when not all fuel is burned during combustion. NOx - commonly nitrogen monoxide and nitrogen oxide - are also produced during combustion. Machinery exhaust, particularly diesel, contains both PM and NOx, as well as other poisonous substances. Tier 4 regulations, by a number of means, aim to reduce the output of these by-products, thereby significantly reducing the number of emissions-related health problems. The EPA believes that a reduction in these emissions will, by 2030, result in an estimated reduction of 12,000 premature deaths, 8,900 hospitalisations and one million lost work days across the USA. But how has it affected the rough-terrain forklift market? Most manufacturers have embraced the engine and chassis changes that were required to comply with the regulations. Guido Cameli, sales manager for Canadian manufacturer Manitex Liftking, says that although major investment was required, Liftking saw the changes in regulations as an opportunity. "Achieving Tier 4 directives required extensive vehicle redesign and new technology such as advanced cooling, exhaust and treatment systems. Packaging of these new systems has allowed us the opportunity to improve other aspects of our vehicles, such as sight-lines and maintenance access," he explains. Xavier Perramon, products strategy manager for Spanish manufacturer AUSA, notes that considerable financial investment was required to meet Tier 4 standards. This year, AUSA will launch its 4-5 T range of rough-terrain and semi-industrial forklifts with 56kW Deutz engines fitted with Diesel Oxidation Catalysts (DOC). The engines not only meet Tier 4 requirements, but anticipate the mandatory 2017 normative. Italian telehandler manufacturer Merlo’s Uliano Bellesia says that new Tier 4 engine adaptations and subsequent testing were expensive and time-consuming. 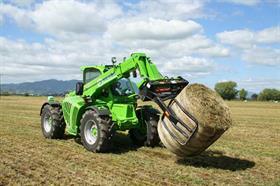 Changes mainly affected Merlo’s 55 kW to 130 kW telehandler range. Above 130 kW, only the ROTO (slewing turret) telehandlers required modification - these have been fitted with a selective catalyst system (SCT) which meets Tier 4 standards. Spanish manufacturer Bomaq has redesigned equipment parts and integrated an additional postfilter burner to its rough-terrain machines. Managing director Antonio Martinez says that an additional issue arising from Tier 4 requirements is the use of electronics in the engines. "So far, we have used mechanical systems for fuel injection, but to reach the required new levels of regulation, use of electronics will be compulsory," he explains. There are other issues, as Richard Rich, wholesale manager of North America-based dealer H&K equipment, points out. Rich says that from a sales perspective, Tier 4 implementation is causing so many problems, at least in the USA, that most of his customers are trying to purchase anything they can that is still Tier 3-rated. "I have not seen a single company change over or update yet," he says. Rich identifies a number of impediments including the need to use ultra-low sulphur fuel when many companies still have huge reserves of diesel onsite, additional maintenance issues like managing an extra fluid compartment for urea and the use of specific engine oils which people are not used to yet. An interesting result of this reluctance to purchase Tier 4 equipment, Rich says, is that companies have improved the quality of their in-house services to keep existing equipment running as long as possible. Despite his reservations, Rich knows that Tier 4 is here to stay and eventually companies will adapt - but the process is going to take a few years. Many in the industry are concerned about the inevitable purchase price increases due to engine re-designs and upgrades. Rich says the requirements could add USD 8,000 to USD 12,000 to the price. Cameli, however, believes that any price hike is more than offset by operational savings. "Yes, our Tier 4 forklifts are inherently more expensive than our Tier 3 variants (but the difference will be more than offset by lower overall operating costs such as up to 5% better fuel efficiency and extended service intervals). The operator will notice improved engine response, with the potential for increased productivity. Additional benefits are quieter operation and greatly reduced emissions," Cameli explains. Bellesia says initial feedback on Tier 4 engine performance has been positive, but Merlo has had to mitigate price rises with offers of extra options. The company strategically timed the release of its new telehandler range so that increased prices could be cushioned by the novelty of new operational systems and options. Pundits have been killing off the rough-terrain forklift for years. First, it was the introduction of telehandlers and now there is talk that the market has reached ‘maturity’. 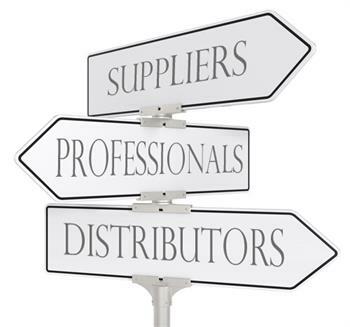 Figures from the Industrial Truck Association for class 4/5 (class 7 figures unavailable) for 2013 US shipments show sales of 66,473 units - up from 58,483 in 2011. Martinez says the market is hard to predict, but believes rough-terrain forklifts have developed their own niche and will expand to other applications if manufacturers pay attention to the needs of users. He says the main markets for Bomaq continue to be in mining, agriculture and the military. AUSA specialises in rough-terrain forklifts for agriculture, particularly in the fruit and vegetable sector where there is high demand for rough-terrain forklifts in the lighter, more compact 3T (6,000 lb.) two-wheel-drive range. Perramon says that globalisation has created ‘new rooms’ in countries in which to develop new markets. AUSA is keen to expand into the US and Eurasian horticultural sectors. He adds that AUSA’s semi-industrial models, based on a rough-terrain chassis - but more compact, with higher diameter wheels and increased ground clearance - are gaining popularity in wood recycling, metal foundries and outdoor warehouse operations. These machines offer added value when the forklift has to push and pull pallets during loading/unloading of trucks. Bellesia believes the telehandlers’ versatility has protected them from any market changes. "In Europe, Canada and Australia, Merlo sells mainly into the agricultural sector. In the USA, it is the construction sector. The balance between the two sectors is our strong point. For the time being, sales are in line with the expected trend, " he says. Cameli agrees the market is mature, but says this is what makes it a robust and growing field as customers realise the machine’s value and performance in rough terrains. Features such as a tight turning radius, compact length, simplicity of design, ease of maintenance and overall cost mean that the rough-terrain market continues to grow. Cameli says new markets in construction, lumber, oil and gas and concrete industries are continually emerging, as well as new geographical markets including Peru and Columbia, where the cost of labour has increased and greater productivity is required in the burgeoning mining and infrastructure sectors. Rich says that sales of rough-terrain forklifts and telehandlers, particularly in the 5-6 T (12,000 lb.) range, have been slow and believes that things won’t improve with the introduction of Tier 4 compliant machines. "Some rough-terrain forklift manufacturers have already informed us that they are running out of their allocations of Tier 3 engines and will only be able to offer Tier 4 as soon as April, 2015," he says. Rich believes the cost of the new machines will negatively affect sales. However, the rough-terrain rental market has been very good, Rich adds. "Rough-terrain forklifts and telehandlers are used a lot in the construction and drilling industries, both of which rely heavily on rentals; so while we don’t see any new markets coming online, the rental demand is increasing." 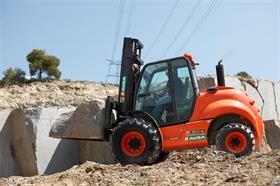 The challenge, he says, is to keep H&K’s supply of rough-terrain forklifts high enough to meet demand. 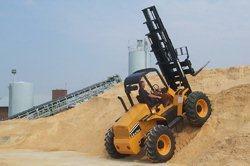 Roll-overs and tip-overs are an occupational hazard for rough-terrain forklifts and telehandlers. Uneven ground, slopes, dips, mud and unbalanced loads are the main dangers, but Luc Pirard, CEO for Belgian company Comatra, strongly believes that uneven tyre pressures are a hidden cause of many roll-overs. "We believe that this type of incident occurs far more often than acknowledged," he says. The Health and Safety Executive of the UK, the Construction Plant-Hire Association of the UK and the Telescopic Handler Association of Australia have all acknowledged that even a minimal 5% drop in tyre pressure can reduce stability and safe lifting capacity by up to 30%. "Because tyres deflect and distort under load, they have a significant effect on stability and load-carrying ability," Pirard explains. 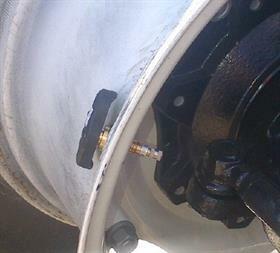 Comatra specialises in safety products for the materials handling industry and has developed a unique internal valve-mounted sensor system to monitor tyre pressure in rough-terrain forklifts and telehandlers. "Most rough-terrain forklifts and telehandlers are fitted with pneumatic tyres as they provide much better flotation on soft ground. The disadvantage, however, is that a pneumatic tyre can be easily damaged or punctured. The most critical situation is a flat or under-inflated tyre with a load in the air – altering the forklift or telehandler’s stability and resulting in a possibly fatal tip-over." Comatra’s pre-programmed sensors are mounted behind the rim, safe from dirt and other corrosive materials, and a monitor is fitted inside the cab. When the forklift/telehandler is turned on, tyre pressure is measured in less than a minute. The kit can be easily fitted by an experienced tyre-fitter. Whilst pneumatic tyres are the preferred option for most rough-terrain forklifts, in recent years alternatives have been developed. Chinese-based tyre manufacturer IST (Industrial Solid Tyres) Company has released a solid tyre for rough–terrain vehicles. 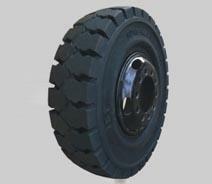 Brine Jiang, spokesman for IST, recommends OTR giant solid tyres for rough-terrain forklifts, particularly for the construction and mining sector, as they feature better puncture resistance than pneumatic tyres, good traction on difficult terrain, and stability under heavy loads. Solid tyres provide better low-rolling resistance which, in turn, will deliver less tyre wear, less heat build-up within the tyre and improved fuel consumption. AUSA has developed a number of safety features which it says are exclusive to its machines. AUSA’s High Visibility System (HVS) allows operators an unrestricted view both forward and in reverse while carrying a full load due to two infrared cameras mounted on the top of the cabin and a colour TFT monitor inside the cabin. The infrared cameras allow the operator to continue working safely in very low light. AUSA’s FullGrip System is a joystick control that allows the operator to engage/disengage four-wheel-drive while in motion at the press of a button. Most believe that the rough-terrain and telehandler market will remain fairly static over the next three years. Martinez says Bomaq will be concentrating R&D on quality and developing multi-purpose machines. The focus will be rough-terrain forklifts that will fit applications where Bomaq’s competitors can’t go. 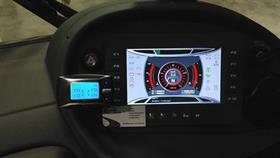 "We have already developed dual controls for forward and reverse – one main control and one auxiliary. 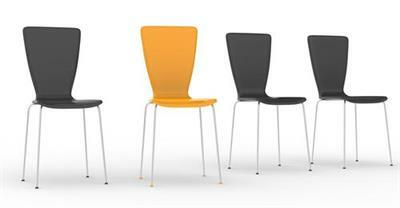 This is to help reduce downtime for the end-user." Rich says that H&K will be concentrating on the rough-terrain rental market while the oil and gas industry continues to grow. Bellesia believes that specialisation is a winning approach and Merlo will continue to concentrate its efforts in this area. 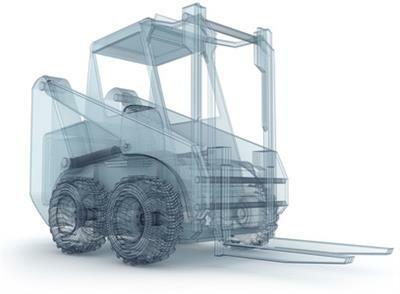 Parramon believes that the future for rough-terrain forklifts and telehandlers lies in making the machines smaller, lighter and more adaptable; designing machines for environments where classic industrial forklifts cannot operate. "The market will demand more sophisticated and optimised rough-terrain forklifts that will be able to work in very tough environments and at the same time restricted areas," he says, tipping more compact, stable, faster machines with lower fuel consumption. UNDER-INFLATED TIRES IMPACT YOUR TELEHANDLER’S STABILITY: KEEP IT SAFE!